3P Self Cleaning Volume Filter VF1 Standard 100mm PVC - Enter Energy & Water. Rainwater filter for installation in rainwater tanks and also in the ground before the tank. Two step cleaning system, therefore high level of filtering efficiency, independent of flow rate. Due to the steep inclination of the filter cartridge the dirt is continuously cleaned away into the sewer. Frost resistant. Self cleaning. 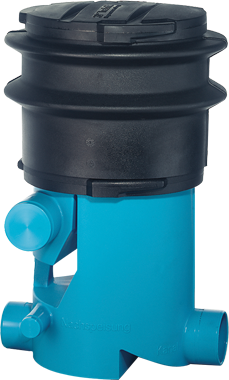 Low maintenance intervals, filter insert is easily removed for cleaning and does not have to be changed. Height difference between inlet and outlet just 300 mm. As water arrives the level builds up and is equally distributed across the cascade. Pre cleaning through the cascades. Largest dirt particles are led across the primary filter cascades directly to the sewer. Pre filtered water then flows over the secondary filter sieve (mesh size 0,65 mm). Due to the special mesh structure of the sieve, any dirt washes directly into the sewer which means the filter is self cleaning, with very low maintenance. Cleaned water flows to the cistern. Dirt goes to the sewer. Plastic shaft for the installation directly in the ground. Material Polyethylen. Installation with telescopic extension in the ground before a plastic tank. Installation before a concrete tank. 3P Volume Filter VF1 Horizontal Outlet 1000585 3PVF1.1000560 3P Telescopic extension for 3PVF1.1000550 removal handle for telescopic extension.